TEHRAN (FNA)- Informed intelligence sources confirmed the Tuesday reports on the preparation of the Syrian Army, the Lebanese Hezbollah and the Russian Air Force for a massive operation under a Joint Command Room to retake the Northern city of Aleppo form the terrorists in the coming days. The sources said that the Russian reconnaissance planes are carrying out their last flights over the fortifications of the militants inside and outside of Aleppo. In the meantime, the Syrian Special Forces and the experienced fighters of Hezbollah are mulling on the different ways to infiltrate into the defense lines of the militant groups at the first steps to the final liberation operation. 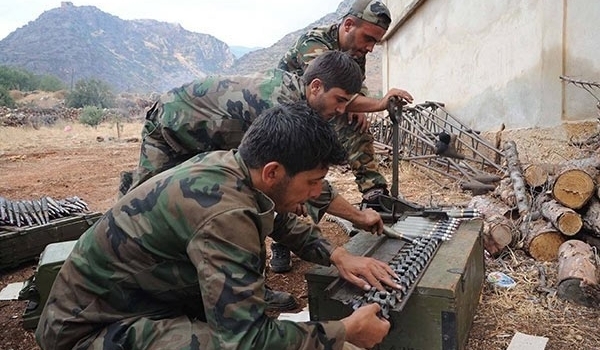 The sources added that the Syrian artillery units alongside the Russian fighter jets will pave the way for the rapid action of the ground forces of the army troops and Hezbollah fighters. On Tuesday, sources said that several fighters of the Lebanese Hezbollah arrived in Aleppo to join the Syrian army to carry out a large-scale anti-militant operation in Aleppo in the coming days with the Russian aerial backup. The sources said that after the victories of the Syrian army and Hezbollah in Zabadani and conclusion a six-month-long ceasefire agreement with the militants in the nearby areas of Syria-Lebanon border, a 200-member group of Hezbollah fighter has been dispatched to the battlefronts in Aleppo. The sources said that the experienced fighters of Hezbollah, the Syrian army troops and the Russia air force are to carry out a massive joint operation to recapture the second import Syrian city of Aleppo in the coming day. TEHRAN (FNA)- Head of the Atomic Energy Organization of Iran (AEOI) Ali Akbar Salehi announced that next Monday will most likely be the official day for declaring adoption of the Joint Comprehensive Plan of Action (JCPOA) by Tehran and the world powers. TEHRAN (FNA)- The Iraqi parliament's Security and Defense Commission announced that given the rapid advances of the Iraqi armed forces in Salahuddin, the Northern province will be freed completely in the next few days. TEHRAN (FNA)- The Iraqi popular forces won back control over Makhoul village near Beiji in Salahuddin province in Northern Iraq from the ISIL terrorist group. TEHRAN (FNA)- Iranian Deputy Foreign Minister Majid Takht Ravanchi stressed the need for rapid action to fight against terrorist groups in the region, and called for settling the crisis in Yemen through political means. TEHRAN (FNA)- Chief of Staff of the Iranian Armed Forces Major General Hassan Firouzabadi described the US as the common enemy of Tehran and Beijing, and said Iran is worried about the plots hatched by Washington against China. TEHRAN (FNA)- A senior security official announced beginning of massive operations in Iraq and Syria to cripple the ISIL terrorist group in the two war-hit countries. TEHRAN (FNA)- Iran's Ambassador to the United Nations in New York Gholam Ali Khoshrou reiterated call for nuclear disarmament of Israel as a serious threat to the regional security. TEHRAN (FNA)- Russian warplanes have destroyed a surface-to-air missile launcher that the ISIL terrorist group previously captured from the Syrian Army, the Russian Defense Ministry reports. TEHRAN (FNA)- The Syrian government forces seized back Tal Na'am in Aleppo province on Thursday. TEHRAN (FNA)- Yemen's army and popular forces shot down a Saudi-led coalition warplane in the Province of Sa'ada on Thursday. TEHRAN (FNA)- A large group of ISIL terrorists were killed in Syrian military operations in the province of Homs. TEHRAN (FNA)- Syrian army troops destroyed two terrorists' operations rooms in the Northern countryside of ‎Homs on Thursday. TEHRAN (FNA)- A senior Iranian lawmaker announced that Tehran will consider sending troops to Syria upon Damascus request. TEHRAN (FNA)- The Syrian army troops won back Al-Masharee' area in Homs on Thursday. TEHRAN (FNA)- Iranian First Vice President Eshaq Jahangiri held a meeting with Armenian Prime Minister Hovik Abramanyan in Yerevan to discuss ways to further broaden relations between the two Asian states.